In conjunction with our Fresh-R-Pax® absorbents, we supply a range of fresh-produce slicers, such as our Tomato & Onion Slicer. They offer food processors massive improvements in yield, and therefore the world’s lowest labour cost per kilo of final produce. MCT-25 Double Row …this machine provides high-quality and high-output slicing. Hence, it will slice up to 6 large tomatoes, remove the unwanted end pieces, and will place 36 slices into a tray (at an output of 24 trays per minute) giving an average yield of 1350Kg of tomatoes per hour. 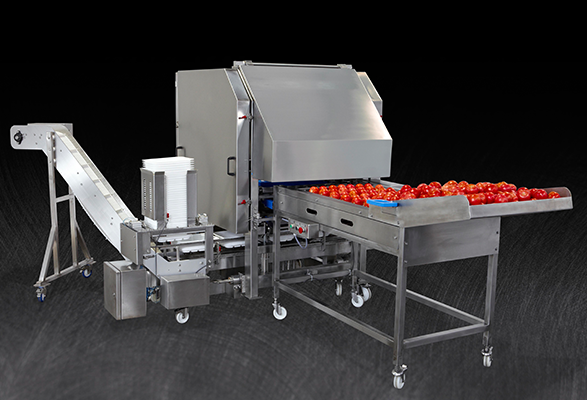 This machine is usually supplied with a tray de-nester to automatically place the slices directly into your tray; Also, it has a ‘take-away conveyor’ to automate the removal of the unwanted end pieces from the tomato. You can also watch the machine in this video. MCT-50 …this machine is similar to the MCT-25 Double Row but is for customers who want to pack produce in a much larger tray. It’s designed to place 126 slices into each tray, to automatically remove the end pieces, and operates at a processing speed of 4 cycles per minute: giving an average yield of 600Kg of tomatoes per hour. To see a video of this machine, please click here. MCT-10 …this machine is similar to the MCT-50, but is a hand-operated version; which is ideal for SME companies, who do not need large capacity systems. It has a yield of approximately 150Kg of tomatoes per hour. To see a video of this machine working, please click here. MCT-Onion Slicer …this is the most efficient onion slicing system in the World, designed for fresh-cut processors who demand exceptional quality and capacity. It’s designed to slice 6 onions per cycle, to remove the end pieces, and to place 36 slices into a tray at an output in excess of 10 trays per minute. It has a yield of approximately 700Kg of onions per hour. To see a video of this machine working, please click here. For help with your fresh-produce slicers requirements or any other problems that you have, please give us a call on +44 (0)1628 531900.